Sherlockians will delight at the latest charming installment of national bestselling author Vicki Delany's fourth Sherlock Holmes Bookshop mystery. Gemma and Jayne donate their time to raise money for the rebuilding of a burned out museum--but a killer wants a piece of the auction. Walking her dog Violet late one night, Gemma Doyle, owner of the Sherlock Holmes Bookshop, acts quickly when she smells smoke outside the West London Museum. Fortunately no one is inside, but it's too late to save the museum's priceless collection of furniture, and damage to the historic house is extensive. Baker Street's shop owners come together to hold an afternoon auction tea to raise funds to rebuild, and Great Uncle Arthur Doyle offers a signed first edition ofThe Valley of Fear. Cape Cod's cognoscenti files into Mrs. Hudson's Tea Room, owned by Gemma's best friend, Jayne Wilson. Excitement fills the air (along with the aromas of Jayne's delightful scones, of course). But the auction never happens. Before the gavel can fall, museum board chair Kathy Lamb is found dead in the back room. Wrapped tightly around her neck is a long rope of decorative knotted tea cups--a gift item that Jayne sells at Mrs. Hudson's. Gemma's boyfriend in blue, Ryan Ashburton, arrives on the scene with Detective Louise Estrada. But the suspect list is long, and the case far from elementary. Does Kathy's killing have any relation to a mysterious death of seven years ago? Gemma has no intention of getting involved in the investigation, but when fellow shopkeeper Maureen finds herself the prime suspect she begs Gemma for her help. Ryan knows Gemma's methods and he isn't happy when she gets entangled in another mystery. 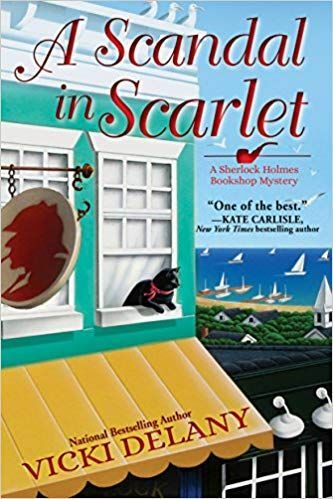 But with so many suspects and so few clues, her deductive prowess will prove invaluable inA Scandal in Scarlet, Vicki Delany's shrewdly plotted fourth Sherlock Holmes Bookshop mystery.